Fully integrated with Gravity forms. 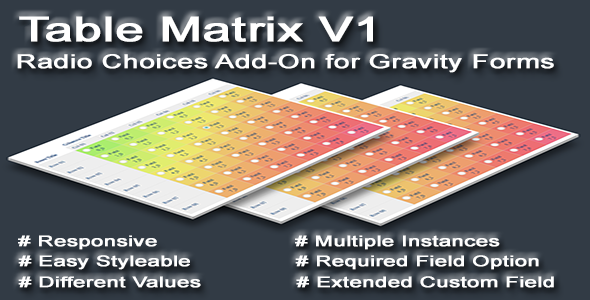 Works conflict free as a extended field and allows multiple table matrixes in one form. Fully responsive. With the styles file the layout and button styles can easy customized. There are seperate style files for editor and preview / website layout styling. We made the hardest part of coding. We tryed to designing and making UI/UX as generic as possible. All you need to do is just upload the plugin into WordPress, activating the plugin, customize the options and you are done! Extend your gravity form with a modern and fresh selection table. Great for choice of tariff, scientific, technical or industrial oriented forms. Also ideal for many sales-oriented applications.